Grace Kelly Style by H. Kristina Haugland. 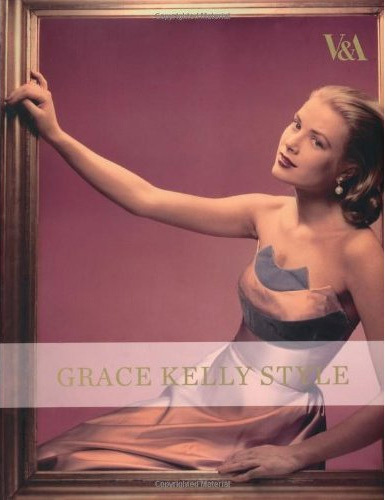 For a volume devoted to the particular components of Grace Kelly’s look I highly recommend Grace Kelly Style, written by H. Kristina Haugland, the Le Vine Associate Curator of Costumes and Textiles at the Philadelphia Museum of Art, with contributions from Jenny Lister, a Curator of Textiles and Fashion at the V&A in London, and Samantha Erin Safer. The book is divided into the three most famous chapters of Grace’s life—the Actress, the Bride, and the Princess—and is further broken down into mini lessons about the particular designers whose clothes she wore—from Hollywood costumers Helen Rose and Edith Head, to Oleg Cassini, Marc Bohan for Dior, Givenchy, Balenciaga, and Maggy Rouff, among others. It holds up Grace’s biographical facts through a prism of style and shows how she used clothes to maximum glamorous effect. An illustration of the McCall Pattern Grace’s dress was made from. This is the catalog that accompanied the exhibit Grace Kelly: Style Icon at the V&A in London in 2010. When I interviewed her for my article on Grace and her Hermès Kelly, Ms. Haugland was not sure if this book would be available for sale this summer at the McCord Museum in Montreal or this fall at the James A. Michener Art Museum in Doylestown, PA, when each hosts From Philadelphia to Monaco: Grace Kelly—Beyond the Icon, since the exhibit will be altered from its original version seen in London. I hope both museums do offer it for sale in their gift shops—it provides a unique look into all the aspects that went into Grace’s style over the course of her remarkable life. I am loving these posts about Grace Kelly. So interesting! On a side note...why have I never thought of using an Eiffel Tower as a ring holder. Duh! I adore Grace Kelly! It would be fascinating to read about her. It looks like a wonderful book! I love Grace Kelly's elegance and style. I would love to read this book! Her style both on and off screen is just wonderful to me and still revelant.